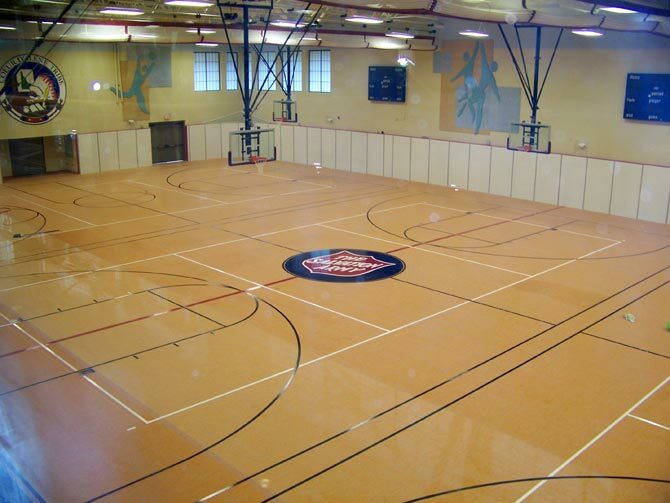 Northern Hardwood Company offers a wide variety of synthetic gym flooring systems that are perfect for: running tracks, multi-purpose rooms, gymnasiums, cafeterias and roller skating rinks. We can customize your synthetic gym flooring surface by offering various color combinations and textures to enhance your specific gym flooring requirements. Our experienced and knowledgeable installers have performed at the leading edge of the synthetic gym flooring industry since these products were introduced in the late 60's. With many options to choose from in both style and appearance, we can provide synthetic gym flooring with a wood grain look, solid color look and even custom colors to match a school or businesses preference. This cushioned vinyl flooring is the highest quality product for athletic and commercial use. The product provides consistent force reduction values with maximum ball rebound for improved performance. SportGrain PlusTM is the ONLY cushioned vinyl flooring product manufactured in one continuous production process and is the easiest floor to keep clean. For more information please visit the Connor Sports Flooring website. These systems are a true dual-durometer and offer superior wear resistance. They are engineered to offer a consistent balance between good shock absorbency and fast play while preventing fatigue. At the same time, they are low maintenance and designed with high deformation recovery and absorb sound. Ask about how they can be “performance customized” to meet your athletic requirements and budget. For more information please visit the Connor Sports Flooring website. For those who prefer the durability of polymeric recycled rubber and colored EPDM granules, these surfaces withstand the toughest demands. Choose from seven color options, and roll or tile form. For more information please visit the Connor Sports Flooring website. This IAAF certified rolled rubber surface is the highest performance product on the market. If you desire to train and compete on the surface Olympians use, this is the product for you. For more information please visit the Connor Sports Flooring website. Weight rooms, locker rooms and heavy traffic areas are the perfect stomping ground for these tear-resistant, one-piece tiles made of vulcanized rubber. SportGuard is available in rolls or tiles. For more information please visit the Connor Sports Flooring website. Multi-purpose ball sport facilities, jogging tracks and heavy traffic areas are the perfect stomping grounds for this dual durometer rolled rubber product. This wear-resistant surface is the highest quality of its type and perfect when tennis and other sports are played over the same area. For more information please visit the Connor Sports Flooring website.